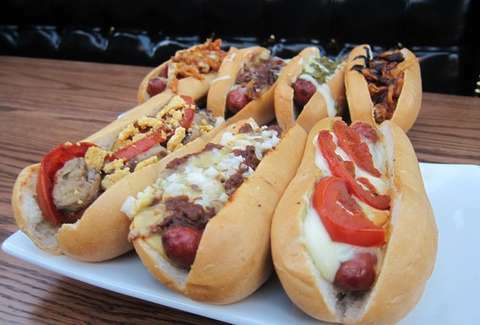 Sometimes, as Freud certainly didn't say, a hot dog is just a hot dog. It's also the most American-est damned food out there, and like all great American things, it changes depending on the region you're in. Sometimes it's covered in beef heart. Sometimes it's wrapped in bacon and outlawed. These are America's greatest regional variations on the dog, and as good an excuse as any to hit the road and sample a little Americana. Typically made w/ pork & veal as opposed to the typical pork & whatever else franks, these snappy Rhode Island wonders come smothered in a thick meat sauce, onions, mustard & celery salt. Initially, they were so named to become more associated with NY's hot dogs, but have since taken on a life of their own... a life that still has outsiders confused as to why they're not called Rhode Island System Weiners. 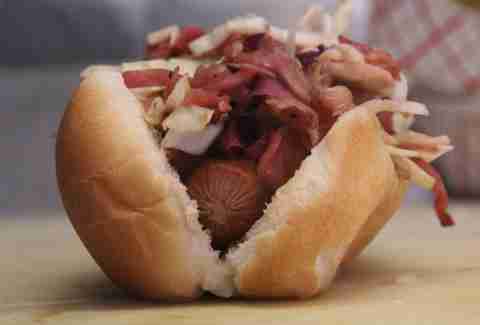 Where to score one: Olneyville New York System in Providence. Taking a cue (aka basically ganking an idea) from neighboring Sonora, Mexico, the sun-soaked folks in AZ have contributed a hot dog to the world that is perhaps its most decadent. This starts with a bacon-wrapped hot dog jammed into a roll, then loaded like a burrito: beans, onions, jalapenos, salsa -- you name it. Then it's topped with sour cream. It's the most delicious thing you'll ever wear. Chicago's residents take fewer things more seriously than da Bears and dispelling da rumors that they talk like antiquated SNL characters. But they take nothing more seriously than their dogs, typically made with Vienna beef sausages slapped on a poppy seed bun w/ tomatoes, pickles, and neon green relish that's no (da) bull(s). Seemingly the only law that Flint and Detroit abide by is the one stating that hot dogs need to be made of real cuts of meat, not just random bits. 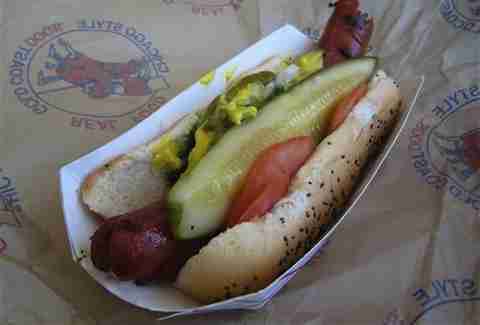 That results in a superior hot dog and two variations on the coney. Both go for mustard and onions, but it's the sauce that mixes it up. 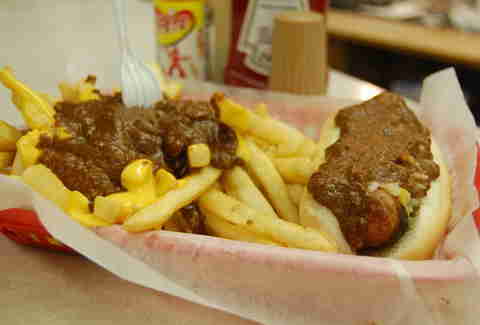 Detroit-style goes for a more smooth chili-approach, while in Flinttown, the sauce is a drier, meatier topping consisting of chopped beef heart and, in an act of wonder, ground hot dogs. Where to score one: In Flint, Angelo's. In Detroit, Lafayette or American. You can't walk three feet in NYC without bumping into a tourist, but you also can't walk one foot without hitting a hot dog stand, which sells $1-$2 wares of questionable quality and unquestionable deliciousness that are basically a food group unto themselves. Get 'em even dirtier with weirdly orange sauteed onions, or just squirt them with mustard and try to eat it before some sweaty tourist bumps into you. Where to score one: RIGHT IN FRONT OF YOU! How did the fat cats on the Hill get so fat? Through a steady diet of DC's signature take on the hot dog: a smoked, coarse pork/beef banger swimming in so much chili, you'd think the government would shut down weekly for group bypass surgery. 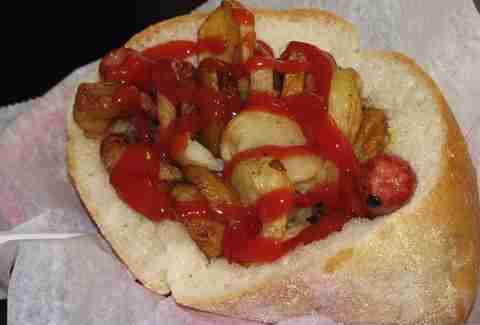 Jersey's answer to those mooks in Philly's stupid cheesecakes, the Italian takes a dog and stuffs it in either a big roll or pizza bread, then smashes it down with a layer of peppers and potatoes. Think you won't need a dry cleaner afterward? Fuhgettaboutit. The minute the clubs let out in LA marks the only time most of its people will actually eat, and the food trucks come out like Twi-hards at a Stephenie Meyer convention. 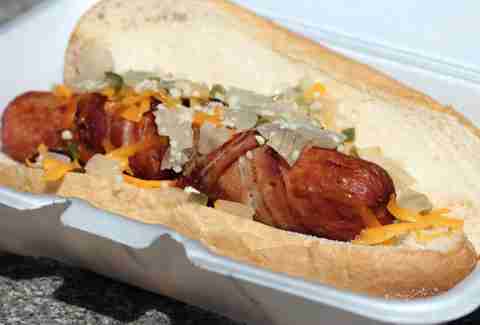 One of their finest delicacies is the bacon-wrapped grilled dog, which's also mostly illegal, thanks to all the health-code violations that come with not boiling them and, you know, serving them from a shopping cart. 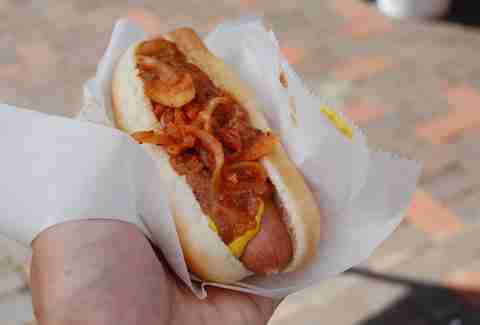 Smother one in greasy-as-hell onions and relish how delicious a life of crime really is. The second best-known dog in Seattle (Frasier's terrier being #1) is the Emerald City's take on the frank, which adds a thick layer of cream cheese to the bun. The rest of the toppings are up to you. Typically, the sausage is grilled and split in two -- just like your sides when you watch the hilarious misadventures of that wacky shrink. Cleveland's unofficial food is basically a melting pot, and way more symbolic of American's converging cultures than the stupid, inedible Statue of Liberty. 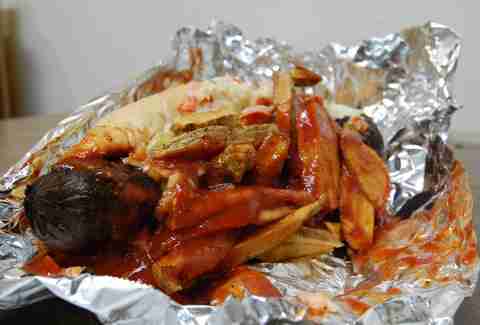 This sloppy mess of awesome consists of a Polish sausage, French fries, and coleslaw all piled into a bun and doused in hot sauce, and is responsible for creating many new variations of the new Colossus. Puka shells are what make it easy to spot a college freshman pledging a frat. Puka Dogs, on the other hand, are something you shouldn't avoid at all costs. 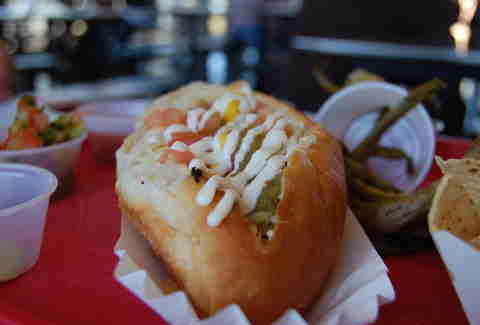 The Hawaiian beast is a Polish dog burrowed in the middle of a sweetbread roll filled with pineapple relish. And it'll ask you to buy it Natty Ice. 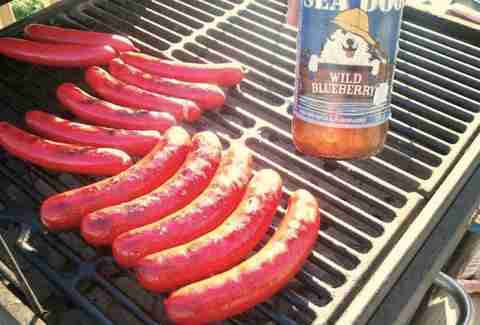 Like the necks of many Stephen King characters, Maine's natural-casing dogs are characterized by an overwhelming redness, furthering the argument started by lobster rolls that nobody in Maine will eat anything on a bun unless it's the color of Satan. 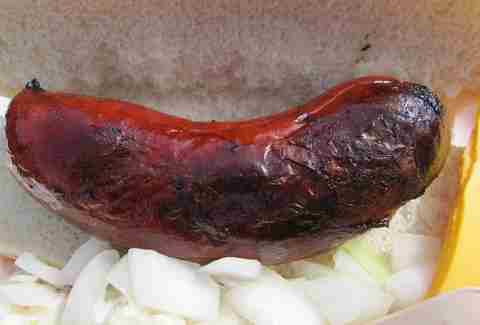 Also known as a dog that's been dragged through the garden, the South's signature sausage is covered in any number of signature slaws, depending on the joint. It's also the closest you're getting to a salad on this list, so you're welcome. If you can pick this sucker up and eat it like a normal hot dog, we're sorry that you have freakishly shaped hands. The Scramble Dog is what Dre said to Snoop after handing him a carton of eggs a chopped-up frank covered with chili and topped w/ pickles, onions, and a packet of oyster crackers, representing the closest thing most hot dogs get to surf & turf. This dark secret kept the elves at Santa's workshop fed throughout the recession, and is possibly Alaska's greatest non-Jewel export. 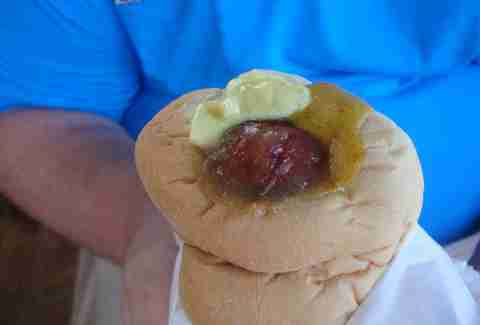 It also can be served just like any other hot dog, except with a gamier taste and a history that haunts Blitzen nightly.